In the bowl of an electric mixer fitted with the whisk attachment, add the heavy cream. Whip for about 30 seconds on high and then add the cream of tartar and confectioners’ sugar. Continue to whip on high until soft peaks form. Add the 2 Tablespoons Lemon Curd and return to high until stiff peaks form. In a medium bowl, toss the blueberries gently with the Wild Maine Blueberry Jam. Spread 1-2 tablespoons Lemon Curd on the bottom of each jar so that it is completely covered. 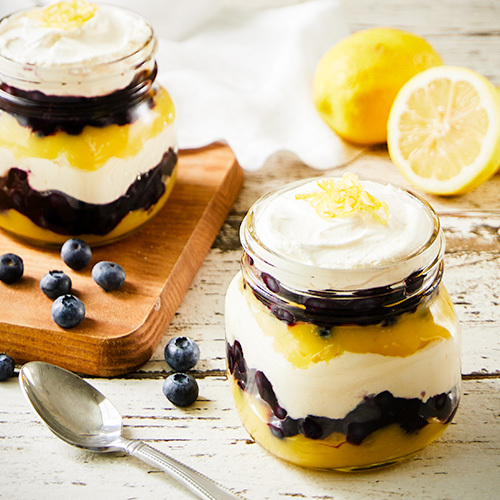 Top the lemon curd with ¼ cup of the blueberry jam mixture. Top with ¼ cup whipped cream. Repeat layers (curd, blueberries, whipped cream) until you have reached the tops of each jar. Serve chilled.